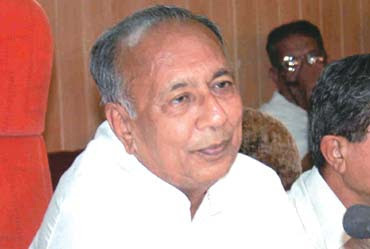 Former BJP chief minister Suresh Mehta has said that the Gujarat government’s assertion about “clean chit” to it by the MB Shah Commission of Inquiry into 17 corruption cases has “no basis”, as the top panel, in its report says, it would “concur” with the conclusions arrived at, among others, by Supreme Court and Comptroller and Auditor General (CAG) on them. The Commission was set up in 2011 by the then chief minister Narendra Modi to probe into allegations of corruption by the Congress against his government, which include wrongful allotment of land to the industrialists. Alleging Rs 1 lakh crore worth of scams in the 17 cases, Congress made a representation on these to the Gujarat governor and the President of India in 2011. The first case cited by Mehta, who was BJP chief minister in 1995-96, is of Indigold Refinery Ltd, which he said was allocated 36.25 acres of land in Kutch district for just Rs 70 lakh, even though the state revenue department officials had ruled against it. “The chief minister’s office (CMO) and revenue minister Anandiben Patel overruled the decision and ensured allocation”, he said. The second instance Mehta cited is that of the Rs 6,000 crore Sujalam Sufalam project, floated to construct a 337-km-long high-level recharge canal in North Gujarat, pointing out that the Public Accounts Committee (PAC) of the Gujarat state assembly, consisting of 15 MLAs, 10 of BJP and rest of Congress, had found a scam worth Rs 500 crore. “At least two official committees, set by the Modi government, one under VS Gadhvi and another under Manjula Subramaniam, found basis on the PAC allegation. While the PAC report, lying with the Gujarat assembly speaker for the last 10 years, has not been made public, the MB Shah Commission could have examined the two other committees”, asserted Mehta. The third instance cited by Mehta is of the Gujarat State Petroleum Corporation (GSPC), whose “failed” KG Basin operation to explore oil and gas off Andhra Pradesh coast, as also expansion offshore to different countries, said CAG, cost the top state public sector undertaking a whopping Rs 19,716.27 crore worth of loan. “It is shocking that the media has been given just a few pages of what the Gujarat government thinks about the Shah Commission report, while 5,500 page report, running into several volumes, was submitted to the state assembly library, with no permission to photocopy it”, said Mehta, who did not reveal how he obtained it.